OK, really this is just an excuse to post a mildy amusing picture of some of us in the days before the Highlanders were even a small gleam in Alex's eye. What you see here is a shot from the CONCACAF Qualifying Tournament for the 2001 FIFA Youth World Championship held at UVic in late February - Early March 2001. The highlight for me was seeing Ian Hume for the first time - been a fan ever since. 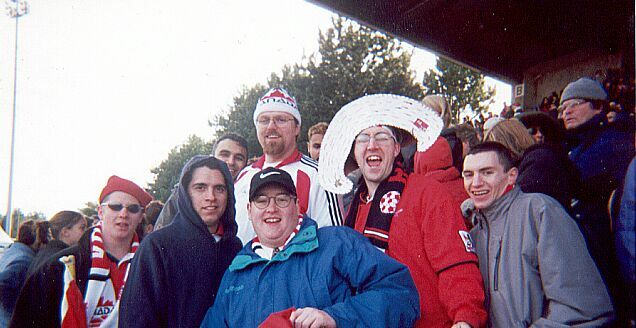 The second highlight was the "Mr Canoehead" supporters hats. Only Drew is wearing his in the picture - I had one as well. I was reminded of this old Voyageurs meme when we recently began tossing around something Steven Hart (current MNT coach) said that has taken on an odd life of it's own: Taste the Soup. As in give our mens national team games a try, it is a mix of odd ingredients, but you might get a taste for it.